When the Desert Rose Band’s Love Reunited reached number 6 on the US Country singles chart in 1987, to be followed shortly thereafter by number-2 hit One Step Forward, it seems likely that few among his new audience recognised the group’s lead singer, Chris Hillman. Then 43 years old, he was an overnight success who’d already been a success for 20-odd years, having been a founding member of the Hillmen, the Byrds, the Flying Burrito Brothers, Manassas and the Souther-Hillman-Furay Band. Desert Rose Band apart, Hillman has had a happy knack all through his career of putting himself where interesting things were happening. Although the Byrds’ music was dominated by vocal harmonies and Roger McGuinn’s 12-string guitar (note how I avoided describing the 12 string as ‘j—ly’ or ‘c—ming’? It can be done, people! 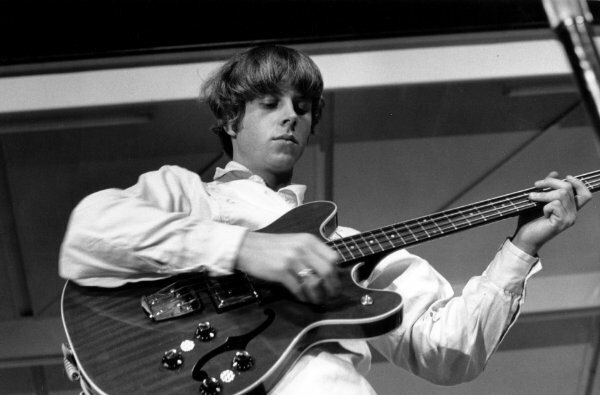 ), Chris Hillman’s fluid, jazzy bass guitar was a hugely important element of the band’s sound. Hillman was not originally a bassist. His first instrument was the mandolin, on which he learned to play bluegrass as a teenager. None of the Byrds were rock ‘n’ roll players, really: perhaps that’s why the band’s take on rock ‘n’ roll was so singular. Hillman took up the bass guitar when asked by Jim Dickson whether he’d be interested in joining the fledgling rock group Dickson had started managing. The group already had guitar players in McGuinn and David Crosby (as well as Gene Clark, who played tambourine on stage but was a perfectly competent guitarist too), but Dickson must have been impressed by Hillman’s musicality and figured that he’d be able to make the switch. Possibly this explains an approach that was far more concerned with melody than it was with locking in with the kick drum (although, pity the bassist trying to lock in with poor, tragic Michael Clarke, whose kick was never quite in the same place twice). The Byrds are still, even today, a common reference point for other bands. Yet when music is described as resembling that of the Byrds, usually it’s the group’s early work that is being talked about: the 12-string-driven folk-rock of the band’s first two records. This constitutes a pretty small fraction of the Byrds’ output, and a tiny chronological span of around 12 months, from the recording of Mr Tambourine Man in January 1965 to when Turn! Turn! Turn! was released in December 1965. By the time their fourth album, Younger than Yesterday, came out in early 1967, the Byrds were all over the map. McGuinn-sung Dylan covers (a reading of My Back Pages that is completely definitive – far better, if far less famous, than their Tambourine Man) were still part of the mix, but so was the satirical So You Want to be a Rock ‘n’ Roll Star, with its Hugh Masekela trumpet solo, Crosby’s raga-like Mind Gardens and no fewer than four Chris Hillman songs, pointing forward to the group’s pioneering country-rock work, and back to the Beatles obsession that had drawn Clark, McGuinn and Crosby together in the first place. It may be true, as my old college friend and all-round musical confrère James McKean once put it imperiously, that it’s no one’s ambition to one day be as good a songwriter as Chris Hillman, yet those songs of his on Younger than Yesterday are all strong efforts, and I imagine McGuinn was somewhat stunned to find his bass player writing or co-writing five songs on an album with only 10 originals on it. So Hillman was the album’s MVP even before one takes into account his sterling work on Crosby’s Everybody’s Been Burned. Everybody’s Been Burned had, apparently, been written as far back as 1962 in Crosby’s folk-club days (the year of the first Bond film, Dr No, so the song’s 007 chord sequence may have been a mere coincidence) and had been demoed several times already for previous Byrds records. The one I link to, which you can find on Preflyte Plus, is stunning in its own right, but the take that made its way on to Younger than Yesterday is among the very best things the band ever did, with one of Crosby’s finest vocals, and instrumental performances by McGuinn and Hillman of intuitive genius. It’s not exactly jazz, but the sensibility is close – Hillman seems less concerned with what Crosby’s chords are than he is with burrowing down deep into the song’s emotional core. His basslines are similarly wide ranging on So You Want to Be a Rock ‘n’ Roll Star, Renaissance Fair and Draft Morning from The Notorious Byrd Brothers, but in terms of empathy and understanding with a singer and songwriter, this is Hillman’s most shining moment as a bass player, and he remains a curiously unsung figure. This entry was posted in Music and tagged 12-string guitar, 1960s, 1970s, bass guitar, bass players, Bob Dylan, Chris Hillman, country-rock, David Crosby, Desert Rose Band, Dr No, Everybody's Been Burned, folk-rock, Gene Clark, Give Some to the Bass Player, Hugh Masekela, James Bond, James McKean, Jim Dickson, Love Reunited, Manassas, Michael Clarke, Mind Gardens, Mr Tambourine Man, My Back Pages, One Step Forward, Preflyte Plus, Roger McGuinn, So You Want to be a Rock 'n' Roll Star, Souther-Hillman-Furay Band, The Beatles, The Byrds, The Flying Burrito Brothers, The Hillmen, Turn! Turn! Turn!, Younger than Yesterday on May 28, 2015 by rossjpalmer.